2014 saw 1,299 NEW single family homes sell through brokerage in the Des Moines market, with 312 new condos and townhomes as well. Ankeny led the way for single family sales with 314 homes, followed by Waukee, Urbandale, Grimes and West Des Moines. 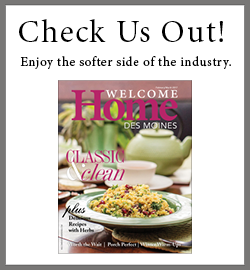 West Des Moines led in condo & townhome sales with 96 sales, followed by Ankeny, Urbandale, Norwalk and Johnston. The start of 2015 has been much better than last year’s beginning. New construction had 125 pended sales in January of 2015, which was up 22.5% over the prior year! You might recall we had a tough January weather wise last year, so the relatively mild weather (comparatively) has helped spur a good amount of activity to start the year. There were 963 new construction homes listed for sale at the end of January, with 2,378 resale homes also for sale. The average price of new construction homes for sale in January was $309,000. January saw 125 new construction pended sales and 752 resale pended sales. Sales at that rate with the current inventory level means there are only 3.8 months of inventory available in the market globally. As we enter the busy spring selling season, inventory of available homes market-wide is historically low. Competition from the resale market is lower than normal, but in new homes the inventory level is in good shape compared to last year. With the continued low interest rates I think the market is well positioned for a great spring. Builders with completed inventory homes should enjoy a very strong spring and position themselves well for the rest of 2015.